Mishca mostly enjoyed the company of her own and other "two-legged" family members. The first time we visited a veterinarian, the veterinarian asked if Mishca is a purebred Norwegian forest cat, which she is not. 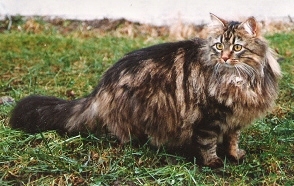 However, we became interested in how a purebred Norwegian forest cat looks like. Soon thereafter Amanda came to us. Mishca was the mother figure of Bifrost's cattery - she had always been there - even though she never got kittens of her own. In summer 2009 we lost our beloved cat-mother, who left a huge void behind her.